← Lars Vilks Attacked by Followers of Admiral Ackbar? The infamous bit of steel and concrete standing in the form of an ancient torture device in the middle of the Mojave desert has been stolen. I have an alibi. Honest. A couple of right wing conservative blogs have variously blamed the disappearance on atheists and terrorists working for the “Muslim-born Obama.” The ACLU, who fought hard to have the cross removed, only to have the Supreme Court rule in favor of its staying, is speaking out against the theft -and well they should. 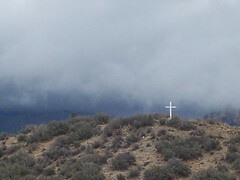 The cross itself is gone but the memory persists like the stench of a skunk run over on a country road. Given the vast, largely unmonitored terrain, it will probably be difficult. Rangers will be looking for fingerprints, tire tracks or anything else that might provide clues to who was responsible. As federal law enforcement officers, they can go wherever the evidence leads them and will have access to a wide range of tools, including forensics equipment. One wonders if there is a better use of time for these public employees than searching for a few feet of pipe and concrete. One wonders if there aren’t some veterans who might benefit from the $25k bounty their “advocates” are offering. I bet this would go a long way to funding a jobs program in a major city. It’s just pipe and concrete. And it was probably a religious nut that took it -either rationalizing that they were saving it from further desecration (the case was returned to a lower court where it was previously ordered to be boxed until a decision could be reached); or a religious nut is trying to frame “atheists” as immoral. After all, who else would steal a metal cross? Personally, I would have felled the damn thing and cut it up on the spot -leaving the remains. That the cross was removed in whole, with the bolts cut at the base, is consistent with someone that cares for its meaning. If an atheist were willing to go this far, they wouldn’t bother stealing it. They would destroy it quickly with a thermite mix they could leave burning while departing. Once thermite is ignited, it’s not going out. This entry was posted in Culture Wars and tagged Law, Mojave Desert, National park, National Park Service, Supreme Court, United States, United States Supreme Court, Veterans of Foreign Wars. Bookmark the permalink.